Charitize was nothing more than an idea when the founding team came to us, so our team built out their first MVP from scratch. I led the team though an end to end design process, including developing three stakeholder flows, a component library, and a full brand guide. A quick preview of some screens from the final product. More below about the process. Our process to build this marketplace was to start with user research. We started by interviewing two types of people: those who primarily donate their time, and those who primarily donate their money. We wanted to understand how these people might engage with the platform, and what might incentivize them to become Buyers (the people buying a service, such as tutoring, handiwork, or child care) or Volunteers (the people doing the service, who choose to route their money earned into a charity instead of their own pockets). These early interviews also gave us insight into the concept of Communities, which we knew the founders of Charitize wanted to be a central component of the platform. Time and time again we heard our interviewees say that they wanted to support organizations with which they have social connections (for example, if their friends have referred them there). Following our interviews, I got the group started on researching existing marketplaces. Charitize is a new concept, so we expanded our research outside of the volunteer bubble and looked at successful marketplaces ranging from food delivery and freelance work to home shares and business fundraising. I love the uphill challenge of brainstorming a user flow from nothing, and this project was particularly engaging because we needed to juggle three entirely different stakeholders harmoniously in one platform. To add fuel to the fire, we envisioned that many users would find themselves wanting to be both a Volunteer and a Donor at one point or another, sometimes donating services and other times paying for them. We split our group into sub-teams that each focused on one stakeholder, though we quickly encountered some setbacks as the planning got quite complicated and the various teams didn’t seem to have a strong sense of the overall flow across all users. Wanting to push the project forward quickly, I had our teams break out into small group design sprints to create the prototype user flows. 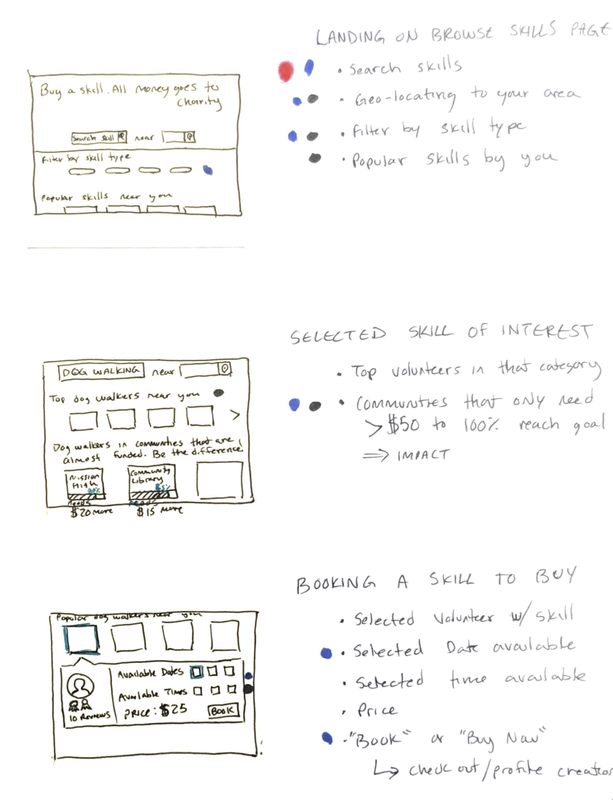 I led the team that dealt with the Buyers (the people actually buying services) through a series of collaborative design exercises with the ultimate goal of defining the MVP features of each major screen in our flow. 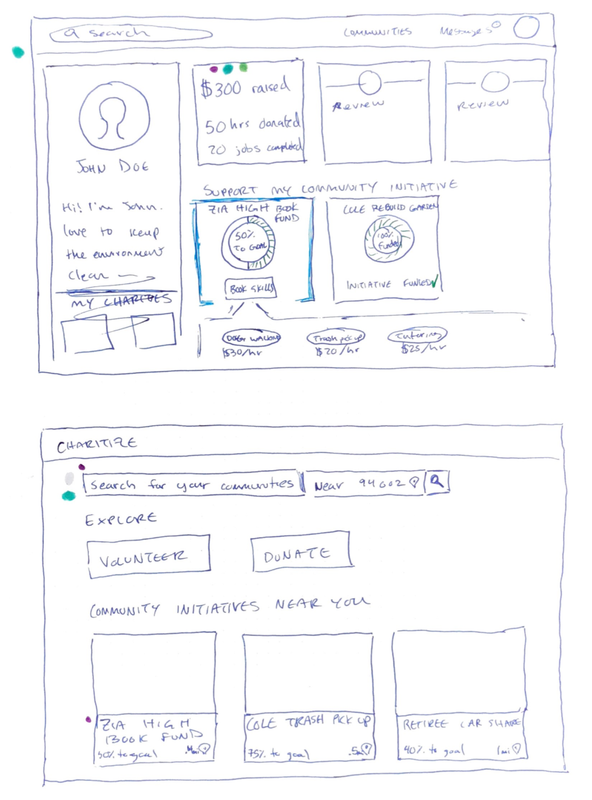 After an engaging series of mind mapping, crazy 8’s, storyboarding, and dot voting, the culmination of our effort was agreement on our favorite features to turn into lo-fi mockups. 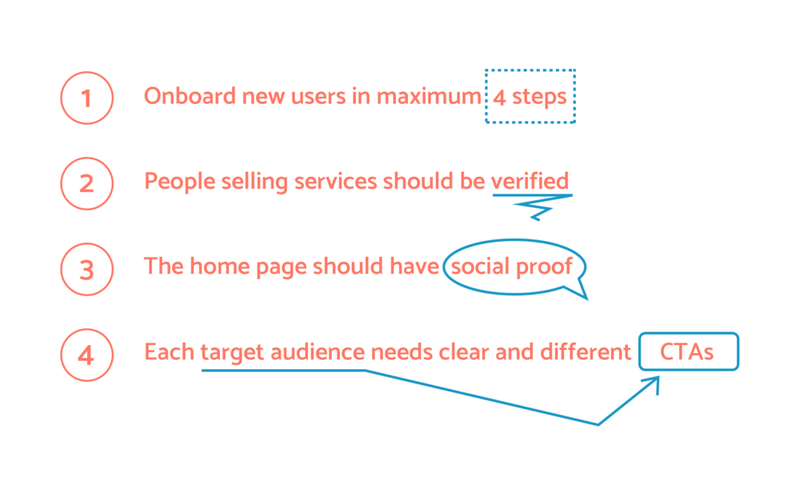 Managing our sub-team focused on the Buyer flow, I emphasized the idea that this wasn’t the time to reinvent the wheel, and instead we needed everyone to flex their research muscle and use design elements that they had already seen effectively in practice elsewhere. We started crunching together very rough mockups, constantly putting them in front of users to get some quick comprehension tests. If a new user couldn’t tell what we were doing in five seconds, we went back to the drawing board. 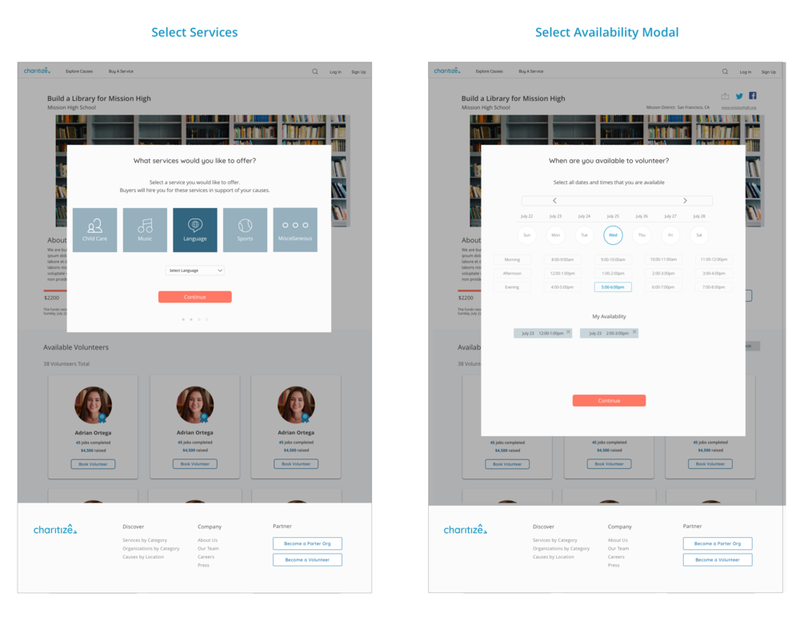 In addition to leading the team effort on the Buyer flow, I focused personally on designing the filter system and search results page, as well as building our overall prototype in Marvel for usability tests. With our lo-fi flows updated and tested, the team jumped into creating the final hi-fi pages to hand over to the client. We still managed to squeeze in time for some final rounds of validation testing, and our ultimate handover even included recommendations for further work that could be incorporated into the next iteration of the product. The Charitize founders were ecstatic with the quality and scope of the work, and I was proud of the output that my team was able to generate in just six short weeks. The startup’s founders are currently implementing our designs with a team of developers and plan to ship the product in the upcoming months as they conduct a few pilot tests with targeted communities.